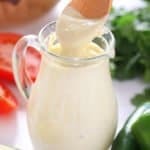 Jalapeño Ranch Dressing takes regular ranch dressing and gives it a spicy twist! It is great over salads or a dipping sauce for your favorite appetizers! 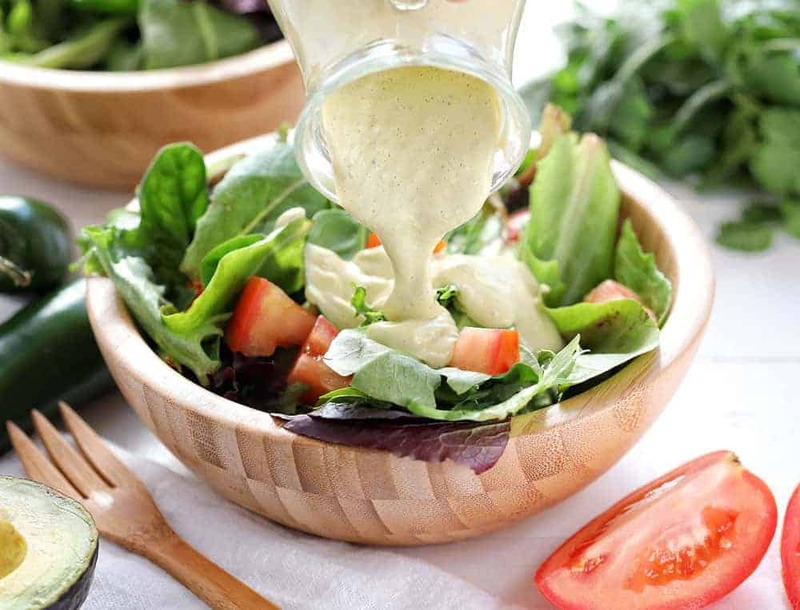 This Jalapeño Ranch Dressing Recipe is great served on a salad like my Grilled Chicken Cobb or as a dipping sauce for Crispy Fried Jalapeños! 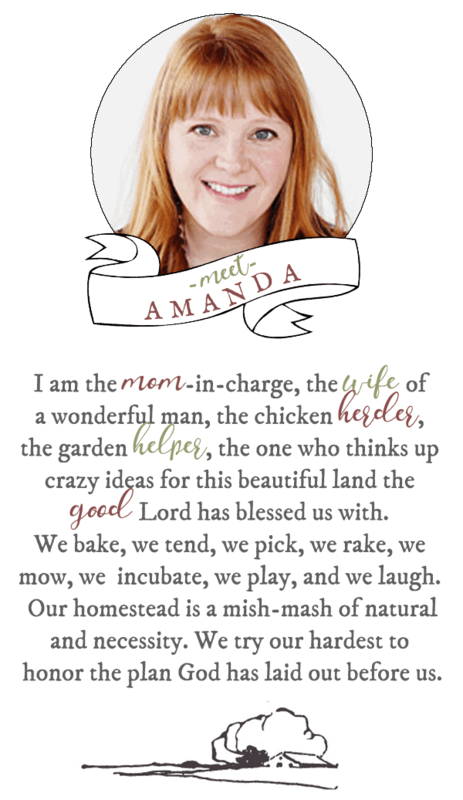 Make sure to check out my recipe for homemade ranch dressing as well! Jalapeño Ranch Dressing takes an all-time American classic and puts a fancy (and spicy) spin on it. This is great served as a salad dressing or even as a dip. The fresh ingredients take an already great thing and make it so much better! If you a looking to spice up your dressing, this is the one. If you are like me and you like things a little spicy, you have been the recipient of the jalapeno that had no kick. On the flip side, you may have had the jalapeno that tasted like a ghost pepper. So, how you can you tell if the jalapeno is spicy? The older the pepper the spicier it will be. Looking at a pepper, the older ones will have stress marks, like little white lines or flecks on the flesh. The younger (less spicy) peppers will have a clear shiny flesh. So if you like them hot, pick the older pepper. If you like the mild, pick the younger one. 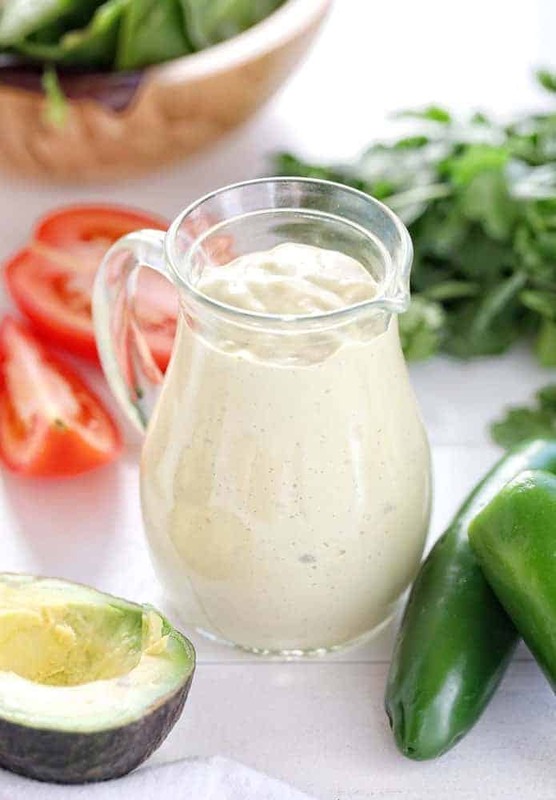 Some of the best jalapeño ranch dressing recipes are pretty versatile too. The reality is that some people like their ranch a little different. Some like it watery, some like it thick, some like it tangy, some don’t. I’ll break down a few keys to get the perfect mixture! Go Full Fat: In our house, we use full-fat dairy products. Primarily because if you spend any amount of time reading the label for a nonfat or low fat or lite version of the same product, you will have a hard time pronouncing all of the ingredients. A simple rule of thumb, if you can’t pronounce it, don’t eat it. In addition to all of the artificial stuff, you are also getting added sugars. Set aside the nutritional benefits of eating full-fat dairy products, the flavor will be much better too. Thick or Thin: Depending on what we are using the dressing for, my preference on this changes a bit. For salads, I like the dressing a little thinner, if I am going for a dipping sauce, a like it a little thicker. This homemade ranch dressing recipe is pretty thick. So, to thin it out, you can simply add a little bit of water, whole milk, or canola oil to the mixture. Keep in mind though that anything you add to the dressing will alter the flavor a bit. Add sparingly, and if necessary, keep a few extra spices on hand to adjust the flavor if you need to. Tang: If you like your ranch dressing a bit more on the tangy side, you can add a squeeze of lemon juice or white vinegar (about 1 tsp) to the recipe. Greek Yogurt versus Sour Cream: Both Greek Yogurt and Sour Cream provide a creamy, tangy flavor in homemade ranch dressing, but sour cream is higher in fat and calories while Greek yogurt provides more protein. If you like the flavor of Greek yogurt, you could pump up the protein in your dressing by swapping out the sour cream and adding greek yogurt in its place. Buttermilk Ranch: Some people prefer the buttery flavor from a buttermilk ranch dressing over a regular ranch dressing. If I am talking about it, you only have to make one modification to this recipe. Simply reduce the mayonnaise to 1 cup and add in a 1 cup of buttermilk. To make the Jalapeño Ranch dressing, you will need a blender. In the blender bowl, add all of your ingredients. Make sure to chop up the fresh veggies before you put them into the blender. Pulse until it is creamy and store in an airtight container. Chill in the refrigerator for a minimum of 2 hours before serving. The chill time allows all of the flavors to marinate together. Once chilled store in an airtight storage bottle. We like to use the squeeze bottles with a lid. How Long will Homemade Ranch Dressing Last? Since this recipe calls for fresh veggies along with dried herbs and spices, and mayo and sour cream, you should be able to store this in your refrigerator for up to 5 days. Use a permanent marker and make a note on the storage bottle so that you don’t run into issues down the road. Looking for Ways to Pair Jalapeño Ranch Dressing? 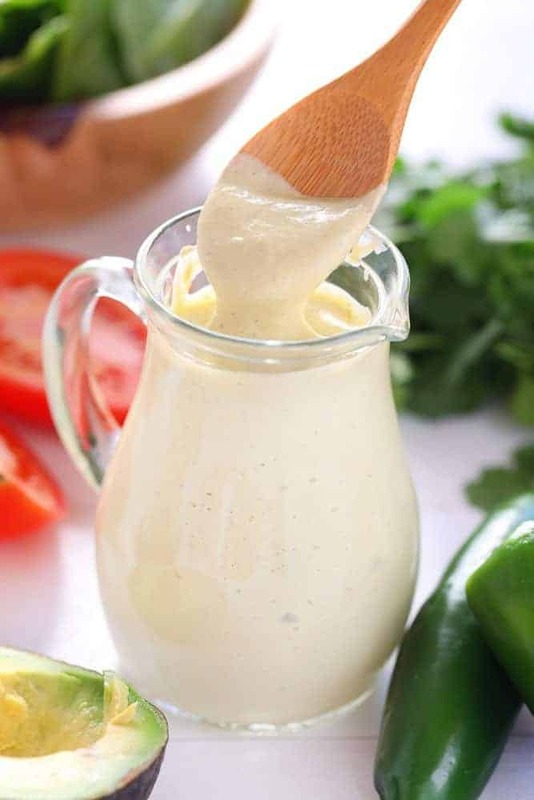 Jalapeno Ranch Dressing takes regular ranch dressing and gives it a spicy twist! It is great over salads or a dipping sauce for your favorite appetizers! Add all ingredients into a blender bowl and blend until smooth. Transfer to an airtight container and refrigerate for 2 hours before serving. Did You Make Jalapeno Ranch Dressing? Making this and the jalapeno beer battered spears for our Super Bowl watch party today. Can’t wait to dish them up and pass them around. I know “my” crowd will love them. Dying to know what you thought! !